Laser tattoo removal has become more and more popular as so many people are getting tattoos. Many people been there. They see “that” tattoo and relive that moment and regret of ever going to get the tattoo in the first place. 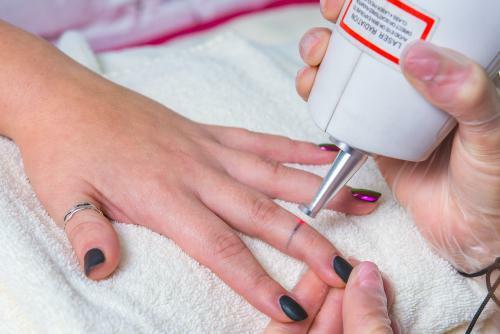 Luckily though, the Enlighten Laser tattoo removal system (which uses picosecond laser) has made the process of tattoo removal much better for those experiencing “tattoo regret.” Many clients also claim that it is less painful than older methods. Every tattoo is different. Not only are there obvious difference, such as the size, color and location of the tattoo, but there are other differences that are not as obvious. For example, there are many different types and formulations of tattoo ink. Many different colors are often mixed to create the final color that you see. In addition, tattoo artists use different techniques of creating the tattoo. The ink can be applied at very different depths from the skin surface in some tattoos versus others. Therefore, the experience of having a tattoo removed may be different from one person to the next. The number of treatments required to obtain a final result will not be the same for everyone. The same principle applies to the actual laser experience; some people may feel more discomfort than others when having a tattoo removed. While the consensus is that the discomfort level of having a tattoo removed is similar to that of having it created, every person has a different pain tolerance during removal sessions. In our center, we use various methods, such as anesthetic creams, to make the treatment more comfortable. Dr. Gosin is a surgeon and is extremely experienced in relieving procedure related discomfort. It is our priority to not only provide the best overall results, but to also provide the best experience while getting those results. If you are experiencing “tattoo regret” and would like to explore the best option for tattoo removal, make an appointment with Dr. Jeffrey Gosin at Shore Vascular & Vein Center. We use the latest, most advanced laser technology available anywhere to provide the most complete tattoo removal in fewest number of treatments, with the best overall experience.